Black Ice Software - Print2Email 10.30 is released! Black Ice Software has released Print2Email 10.30, which includes many new features and improvements. 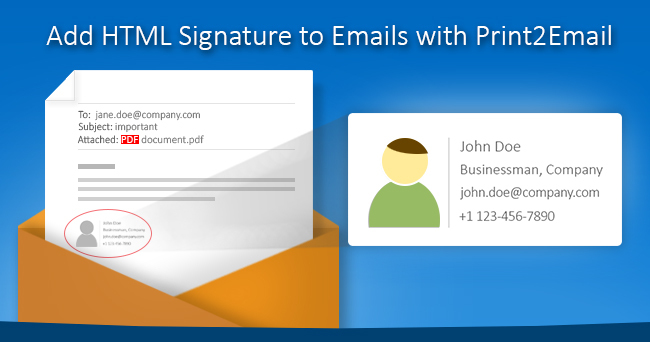 The Print2Email now supports HTML or Plain text email format selection. The HTML email format allows users to send emails with a signature that includes an image, picture or logo. Several improvements for better compatibility with Outlook 2016, Audit log, and the user interface have been implemented as well. A new feature has been added to the content based email sending for when the “Enable Content Based Email sending” and “Send each page as separate email” options are enabled. Now when one prints a multipage document to Print2Email, the Print2Email will extract the recipients, email subject and email body from every page, and send the pages in a separate email as an attachment. If the Print2Email finds a page without a recipient, it will merge the page(s) to the previous page until the next email recipient tag or the end of the document is found. To specify the recipients, email subject and body in a page, one has to use special character sequences. A new command has also been added to the content based email sending. The new command allows users to configure and send an external file as additional attachment, that is then sent with the generated email. Print2Email 10.30 also includes several stability improvements to the MSI installers for large scale deployment with better error reporting and resolves some installation issues with Citrix servers. Change "Do not display email sent successfully message" to "Display email sent successfully message"
Change "Do not display MAPI error message" to "Display MAPI Error message"
Change "Turn off Outlook Security Alert popup window" to "Display Outlook Security Alert Window"
Stability improvement with Outlook 2016 64 bit and Outlook 2016 32 bit.